It's Liam's birthday, so every day this week (which I've deemed #LiamWeek) you'll find a video about him on either ObbsandLala or VlogsandLala (alternating between channels) and I thought I'd do a few blog posts as well. In this one I'm going to tell you about Liam's favourite books from the past year (so while he was 3 years old). I've had a few people comment and message me after posting this video of Liam's bedtime routine, trying to figure out what this book is and where to find it. It has proven to be a hard one to find (I just happened across it in a thrift store years ago) but is totally cute. It goes week by week of pregnancy, talking about what the mom is going through, as well as the baby inside her belly. I think Liam loves it because he gets to learn about how he came into this world, and I bet it would be a great book for introducing the idea of a sibling to your child! A little owl trying to find his mother, very simple and repetitive language which I think is perfect for this age. This is a series of books that helps guide your child through situations, shows them how to act appropriately and express their emotions. "How do dinosaurs.." Say Goodnight, Say I Love You, Eat Their Food, Clean Their Rooms, Say I'm Mad etc. This one in particular is our absolute favourite; he's obsessed with dinosaurs and also needs a little extra help with making bedtime happen smoothly. A total classic, doesn't need much explanation. George is a curious monkey who gets in all sorts of mischief, but always learns a lesson by the end! I swear this pig has swept the nation, I don't know many little girls who aren't totally taken by this piggy. Liam is equally as smitten, and I already have the Olivia Christmas version stashed away for next Christmas! This is a whole series of books that everyone at his preschool is obsessed with. Personally, I find this cat super creepy looking, and have a slight hunch that this fictional cat is totally on drugs (the book ends with "the moral of the story is - no matter what you step in, it's alllll good") hahaha but seriously though.. This is more of a picture book, with the only word throughout it being "hug" over and over again. I think he likes this one because it was the first book he could "read" by himself. He recognized the word bubbles, and started imitating us saying "hug" when he was probably 2 years old, and to this day he's still really into it. I love this book for the amazing illustrations and Liam loves the story. The language is quite advanced so Liam is always asking what certain words mean, like "haste" and "perilous". We have a few Oliver Jeffers books on our shelf and I can't wait to get him some more! This was one of the first books I remember reading myself when I was a kid, and I totally loved it. A little boy loses his mitten and a bunch of animals decide to make it their home. Very simple and repetitive again, perfect for toddlers. 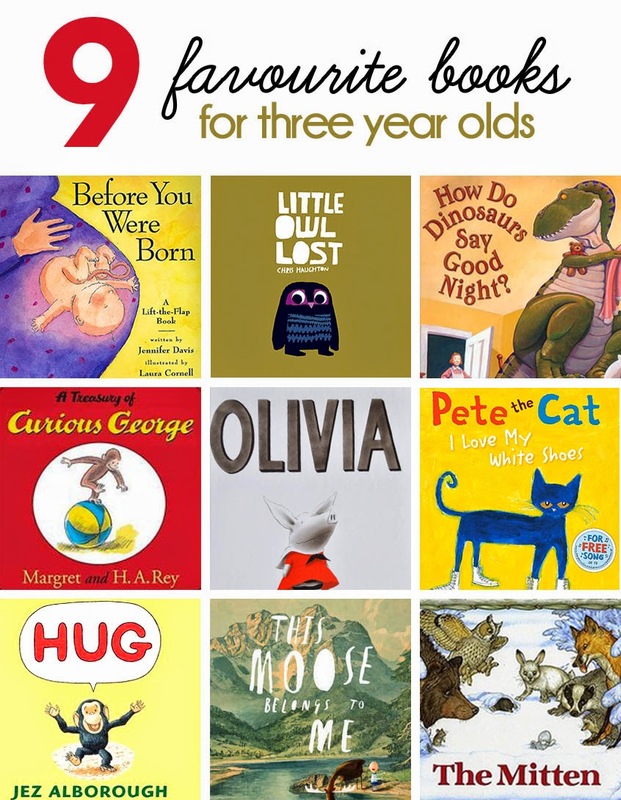 Baby Lit, Master Collections - these were his favourites when he had just turned 3, I think they were just fun to look at, but have no actual story...so he's pretty much grown out of them by now. They are basically an introduction to classic novels, not the real story by any means (don't worry, no death involved or anything haha). They are designed for babies/toddlers, as an introduction to colours, numbers etc. Character Books - he does love his kiddy tv shows, and definitely loves books based on those like Diego, Dora, Blues Clues, Caillou, Chuggington etc. These of course just depend on your kid's TV show preferences, so I didn't think they would be as fun to mention in the main post. Thanks for reading, please be encouraged to recommend your child's favourite book!